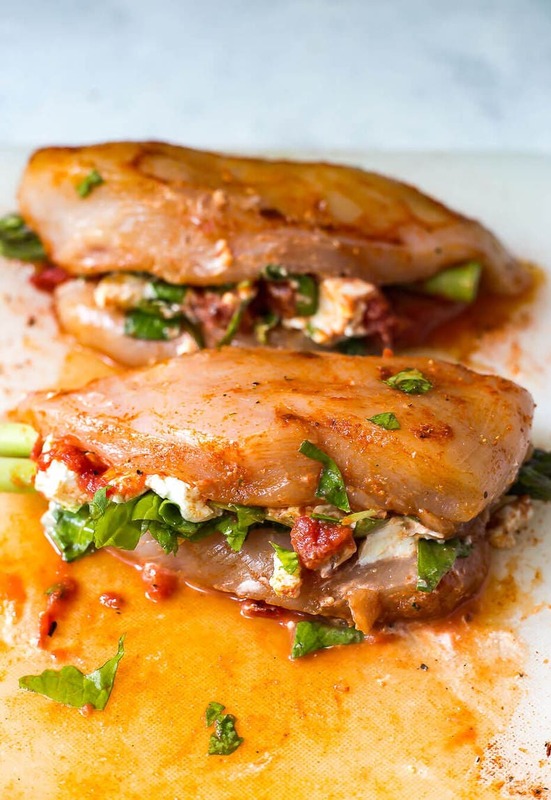 This Margherita Asparagus Stuffed Chicken with goat cheese, tomatoes and spinach is a delicious and easy 30-minute, low-carb dinner idea cooked on the BBQ! This post is sponsored by Muir Glen. Thanks so much for supporting the brands I love – they help keep my blog up and running! 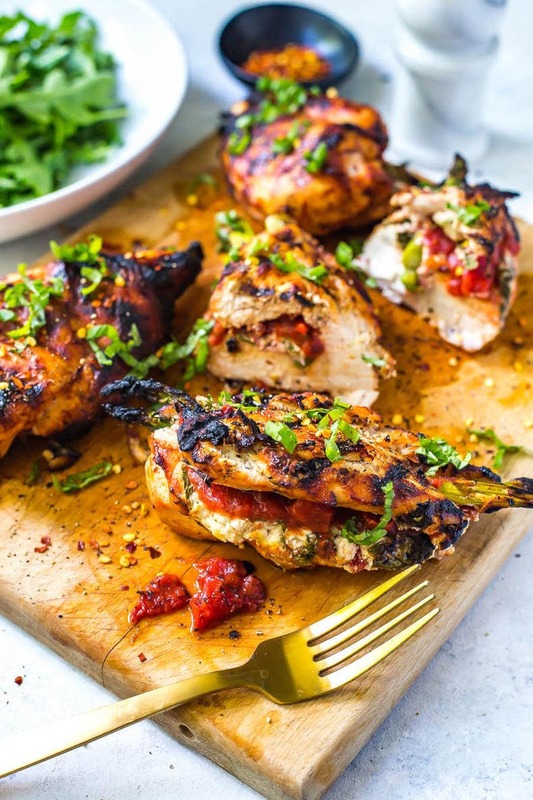 Let me present to you my latest summer recipe obsession: GRILLED STUFFED CHICKEN. OMG, I can't even tell you how many different combinations I've made so far this summer. So, in an effort to bring you my very favourite version, I've tested and eaten a variety of different types of stuffed chicken. I mean, I'm kinda stuffed myself over here, it's insane. Stuffed full of chicken that is. And my favourite kind? Margherita Asparagus Stuffed Chicken. With goat cheese and spinach. How much more delicious can you get?! 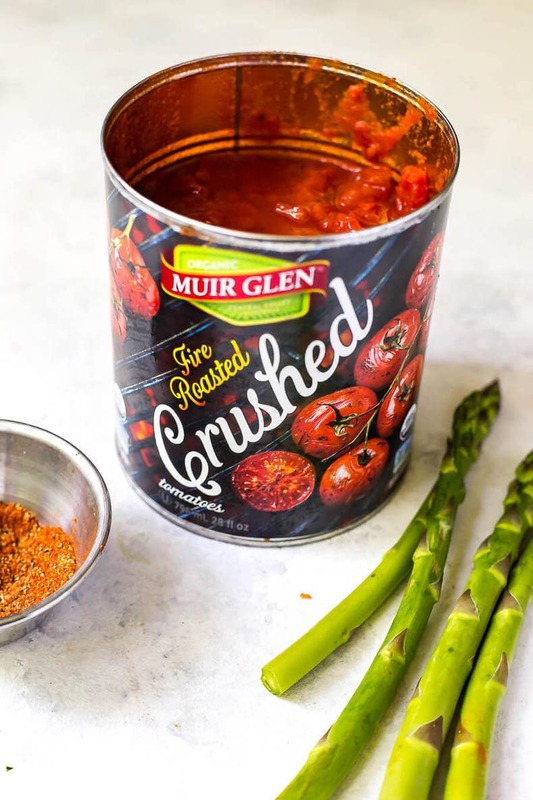 I'm all for adding wholesome ingredients that act as quick and easy shortcuts for dinner, and that's where Muir Glen organic fire-roasted tomatoes come in. I've worked with Muir Glen before on a delicious fire roasted bruschetta recipe, and honestly LOVE the variety they offer and the fact that they're high-quality, organic products that really pack a powerful punch of flavour. Gone are the days of blankets and endless hours of Netflix on the couch with big bowls of spaghetti, slow cooker meals and soups. Bring me ALL the BBQ chicken. I'm seriously going to pretend winter's never coming back. So let's get down to the nitty gritty of this Margherita Asparagus Stuffed Chicken. 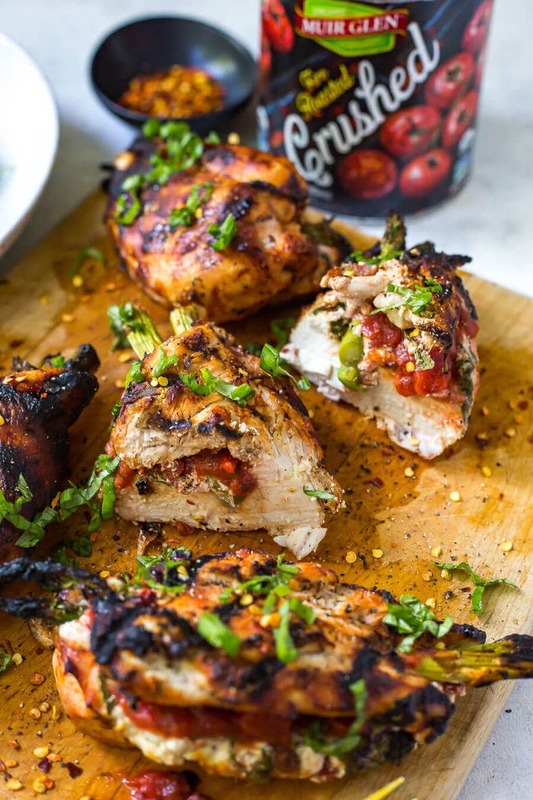 Stuffed Chicken is way easier to make than it looks, and while you can also bake it in the oven, I think it's best done on the BBQ so you get a bit of char and that smokey flavour we all die for in the summer. 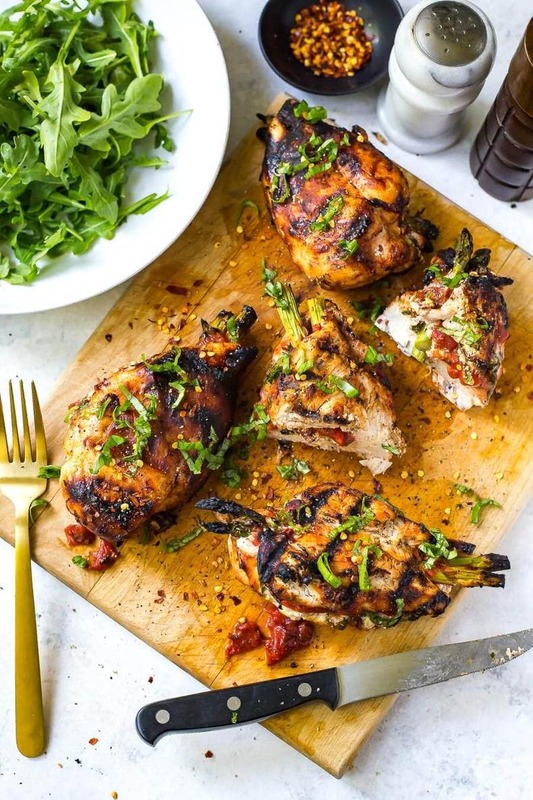 The trick is not to overstuff your chicken, and to make the right cut down the middle of the boneless, skinless chicken breast. I try to find the natural opening and cut a little bit further into the thicker part of the chicken breast, and then I layer ingredients carefully. Two sprigs of asparagus should work here, and just a couple spoonfuls each of the fire-roasted tomatoes, goat cheese and spinach. You can use string or rubber bands to hold the chicken in place if you want, but if you make the right cut in the chicken breast it's usually easy enough to just fold the thicker part over and put it on the grill. I used to think of BBQing as such a daunting task but it's actually pretty simple: you'll usually cook any type of meat for no longer than 10 minutes per side, especially if you have the grill on high heat, and you can usually tell something is ready to flip when it comes unstuck easily. With this Margherita Asparagus Stuffed Chicken, everything should stay in place even with all the deliciousness stuffed inside. This really is such an easy recipe to customize. You could literally use whatever you have on hand in the fridge and it doesn't hurt that the fire-roasted tomatoes are a pantry staple. Use up whatever greens you have that are about to go bad, or even another green vegetable like broccoli or rapini would work perfectly here. Mozzarella and feta are two go-to sub-ins if you're like my mom and not a big fan of goat cheese. Really, the options are endless. And may I suggest some fresh herb add-ins like fresh basil or oregano? YUM!!! 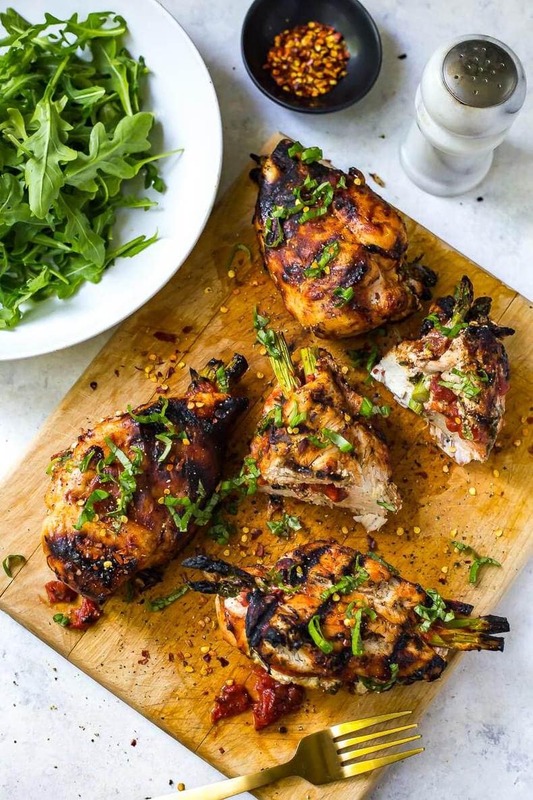 Will you be making this Margherita Asparagus Stuffed Chicken? 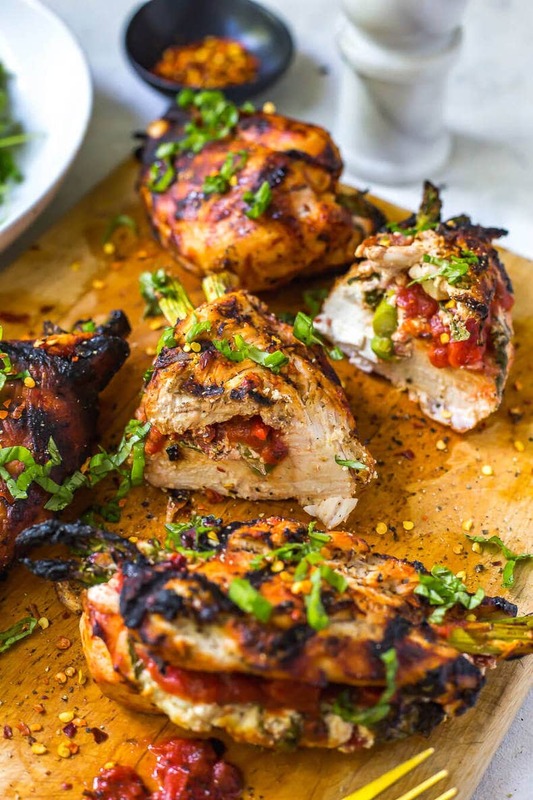 I think my next goal for the summer is to see how many differently delicious ways I can stuff a chicken breast. Gimme all the veggies and flavours!!! Preheat BBQ to med-high heat. Make a deep cut in the middle of chicken. Season with a mix of paprika, garlic powder and salt, rubbing chicken well all over. Add two asparagus spears to each breast, then top with about 1/4 cup of Muir Glen fire roasted tomatoes, 2 tbsp of goat cheese and 2 tbsp fresh chopped spinach. Fold each chicken breast over, tying with a string to hold together if desired. Place on BBQ and grill for 15-20 minutes until chicken is fully cooked inside. 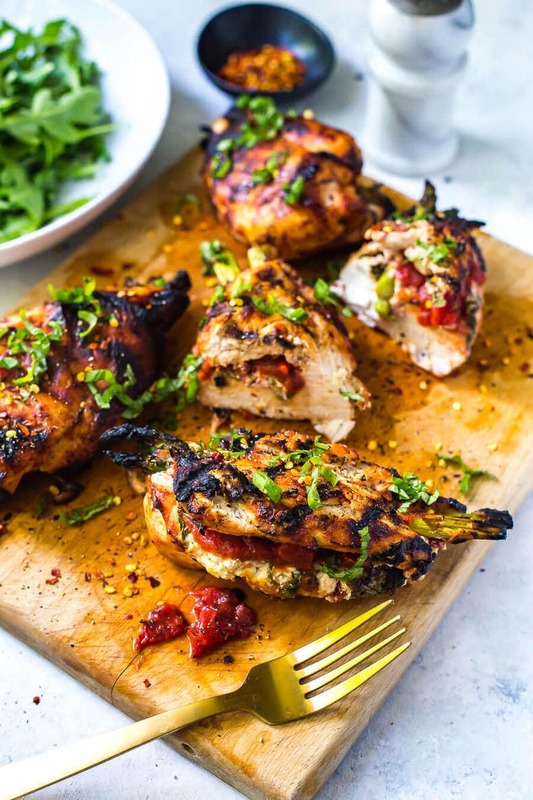 Remove from grill and garnish with basil and red chili flakes. Serve with your choice of side and enjoy! I am for sure making this! But I don’t have a grill. Do you know what to preheat the oven to and how long to bake for? Thanks!